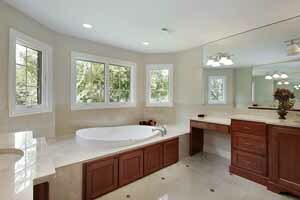 Boston Stone Works - Natural and Engineered Stone For Your Bath. We at, Boston Stone Works, believe that using natural or engineered stones for bathroom vanity tops, tub or jacuzzi surrounds, walls, benches, shower jams and thresholds is an outstanding option that will augment the elegance, decor, and feel of any bathroom renovation project. We offer a myriad of stone surfaces, finishes, and edges that can be applied to achieve diverse architectural and aesthetic effects. Boston Stone Works has years of experience working with homeowners and building professional alike on how to apply natural and engineered stone products into your bathroom design scheme. Every bathroom project is custom designed, fabricated and installed to your ultimate satisfaction, offering options that are essentially limitless. Implementing a natural or engineered stone product is an excellent choice for your bathroom project as many surfaces, whether natural or engineered, are durable, non porous, stain, scratch, bacteria, mildew, and mold resistant. 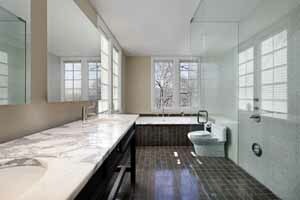 To see more bathroom projects, visit our Bathroom Gallery.